Dartmouth Mall is it's own Cinderella story since the completion in November of its renovation. 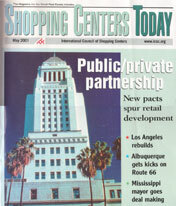 Prior to the renovation sales had dropped to $200/sf by 1997 the year PREIT bought the center. Today Dartmouth Mall is doing swimmingly. Sales run about $400/sf and the center is 96% leased. "This was not a casual coat of paint," said Tim Colby, senior regional manager with PREIT. CREATE tore out an old dropped ceiling, ripped up drab gray tile floors and redid the entrances. In fact, there is very little that has remained untouched. The curvature of ships' hulls, the play of light on water and other references to the nearby sea can be found in the design by CREATE. Entrances have 35-foot masts with steel rigging; corridors are paved with tile mosaics of compasses. "Everywhere you look is something interesting," Colby said. "It's a big success story." All these factors combined have helped Dartmouth Mall once again feel like the most popular kid on the block.